McLoughlin, D., & Mynard, J. (2019). Introduction. Studies in Self-Access Learning Journal, 10(1), 1-4. Welcome to the first issue of 2019 which is a special issue containing papers from the third Psychology of Language Learning Conference (PLL3) which took place at Waseda University in Tokyo from June 7-10 2018. We both had the pleasure of attending the whole conference and enjoying five excellent plenary sessions and dozens of high-quality and stimulating presentations over the four days. 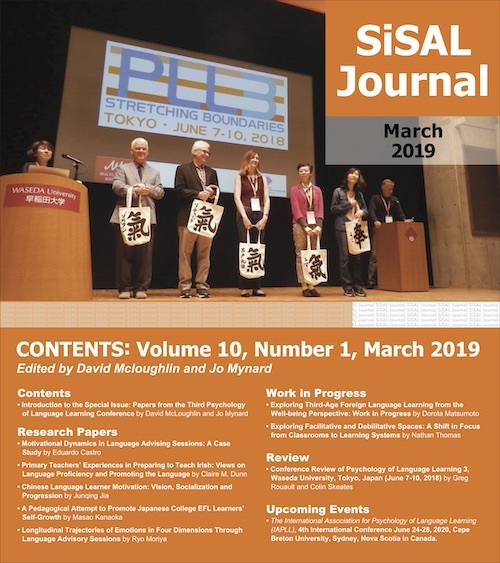 Summaries of more presentations were included in the 36 chapters of the Conference Collection edited Mynard and Brady (2018), but this special issue of SiSAL Journal features selected papers that were relevant to the scope of this journal. Greg Rouault (Tezukayama Gakuin University, Japan) and Colin Skeates (Keio University, Japan) provide a review of the conference which is included in the reviews section of this issue. There are five research papers in this issue from different research settings. In the first paper, Eduardo Castro from the Federal University of Pará, Soure, Brazil shares a longitudinal case study of a learner from the perspective of Motivational Dynamics in Language. The learner is participating in advising sessions where she notes her motivation at the beginning and the end. In addition, she notes motivation outside of advising sessions. The interpretative phenomenological analysis suggests that advising is an emergent property of the advising process. In the second paper, Claire M. Dunne from Marino Institute of Education in Dublin, Ireland reports on a study which explores the process of becoming a primary level teacher of Irish. The author analyses similarities and differences in views on the teachers’ role in promoting the Irish language and issues related to Irish language proficiency, at the beginning and end of a teacher education programme. The results suggest that there are shifts in the ways in which teachers conceive of their roles as teachers of Irish. In addition, it is suggested that more support for this role is provided. The third paper, by Junqing Jia, examines the importance of vision on sustaining long-term motivation. She presents case studies of two advanced learners of Chinese and discusses how their well-constructed and robust visions of their future L2 and C2 (second culture) selves allowed them to develop resilience and sustain motivation in the face of setbacks in their language learning journey. The author suggests that through having such a self-constructed vision, together with extended socialization and a sense of progression, learners are able to create a self-sustaining motivation system. In the fourth paper, Masao Kanaoka from Kagoshima University in Japan draws on Ushioda’s (2009) person-in-context relational view of motivation. The author describes a pedagogical intervention and research study which investigates identity, inner spirituality and L2 practice. The results indicate perceptible self-growth, including positive self-image and positive impressions of the English language. The qualitative study by Ryo Moriya from Waseda University in Japan explores the longitudinal trajectories of emotions mediated in advising sessions with two Japanese secondary school students. Using Plutchik’s wheel of emotions, the author acknowledges both contextually complex and longitudinally dynamic aspects of emotions. The paper concludes with a tentative four-dimensional model of emotions which captures trajectories of advisees’ emotions from multiple perspectives. In the first paper, Dorota Matsumoto from Waseda University in Tokyo, Japan shares some findings from a longitudinal study looking at how third agers in Japan conceptualize their foreign language learning experiences and how those experiences and conceptions of them contribute to learners’ well-being. In particular, the study is examining the role of savouring (i.e., attending to and appreciating experiences) in well-being. In this paper, data from one in-depth interview are presented. In the second paper, Nathan Thomas from the University of Oxford, UK discusses facilitative and debilitative formal learning spaces – classrooms. The author suggests that principles from self-access learning should inform the design of classroom spaces. Furthermore, the author argues that such learning spaces should be viewed as complex learning systems; in addition, the strategies learners use in those spaces are themselves complex systems. This view of learning spaces as complex language learning systems is offered as one future direction for research. The fourth Psychology of Language Learning Conference will take place from June 24-28 at Cape Breton University in Sydney, Nova Scotia in Canada. The conference chair is Peter MacIntyre who is also the current president of IAPLL. The theme of the conference is “Themes and Waves” which was inspired by the physical location of the upcoming event, but is also a metaphor for the currents and waves that shape our thinking about language teaching and learning. For updates, see the website https://www.iapll.com/pll4. David McLoughlin is an Associate professor in the School of Global Japanese Studies at Meiji University in Tokyo. He has an M.Phil in Applied Linguistics from Trinity College Dublin, Ireland, and an Ed.D. in TEFL from the University of Exeter, in the UK.His research interests are motivation and affect.